A lion cub has led forest rangers to its mother's corpse in an Indian sanctuary, an act described by officials as very unusual behaviour. A forest guard, who saw the cub hiding in the bushes, followed it and went on to discover the body on a nearby hill. The cub then guarded his mother until the ranger returned with forest and police officials to remove the carcass. A post-mortem suggests the lioness died in a fight with other animals, possibly a herd of water buffalo. Deputy Conservator of Forests in Gir, Anshuman Sharma, said the cub's behaviour was "rare" and "very peculiar" - something he had not encountered in his many years of watching lions. Gir in Gujarat state is home to Asiatic lions and, according to the last census done in 2010, there are 411 lions in the sanctuary. "On Saturday afternoon, I was patrolling the Tulsi-Shyam range of the sanctuary when I saw a cub hiding in the bushes," forest guard Rana Mori told the BBC. Such small cubs are never found alone, they are generally accompanied by their mother and Mr Mori says he started looking for the lioness. "I followed the cub which led me to its mother's body lying on a small hillock. The mother was called Rupa [the beautiful one]. It initially looked like she was sleeping, but when it didn't move, I prodded it with my stick. That's when I discovered that the lioness was dead," he said. When Mr Mori returned with a team of officials to remove the carcass, they found the cub still sitting near the body. The lioness, who was about 11 years old, had broken ribs and internal injuries and died from a haemorrhage, Mr Sharma said. 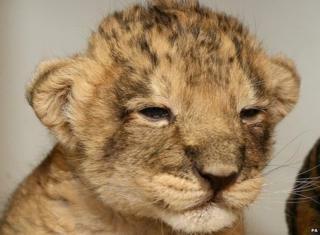 Lion expert Yadvendra Dev Jhala of the Wildlife Institute of India told the BBC that he had never heard of a similar incident involving a lion cub. But he says that in Gir there has been very little conflict with humans and "lions generally know their individual guards well". Mr Sharma says lions are known for their social behaviour: "They are not like dogs, they won't shake paws or wag tails, but we believe they recognise guards they see every day." Wildlife officials say cubs are totally dependent on their mothers for survival until the age of two-and-a-half to three years. The cub, only 15 months old, is now under the constant observation of forest officials. "Its mother, Rupa, seemed to be a loner who lived and hunted alone, But now that the lioness is gone, we expect the cub to join another group, or another lioness may start looking after it," Mr Sharma said.